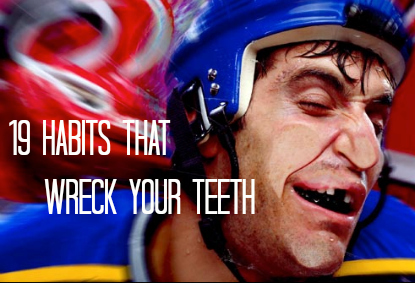 19 Habits Wrecking Your Teeth ~ How Many Are You Guilty Of? WebMD, a leading online health authority, recently published a slideshow of the 19 habits wrecking your teeth. How many are you guilty of? But more importantly, do you know why these habits are bad for your teeth? How many of these habits do you need to break? Click Here to view thew WebMD slide show and find out exactly why you should stop each of these today.